What Is the Yellow Peel? The Yellow peel is one of the most effective treatments against pigmentation caused by sun exposure, ageing, scars and inflammation. It is a quick recovery peel that delivers significant benefits with minimal social downtime. It is a great “end of summer” skin treatment: removes damage, blocks pigment synthesis and promotes skin recovery. Although the yellow peel is considered a superficial chemical peel, through its ingredients, it works in the deeper skin layers and delivers the benefits of deeper peels without significant swelling and redness. What are the indications for a yellow peel? Like any other peel, it works best when the skin health has been optimised: minimal amount of dead skin cells, good hydration, anti-oxidation and healthy dermis. What is the Yellow Peel treatment protocol? The patient is then given the yellow peel and instructed how to use it at home. The peel is left on the skin for a minimum of 4 hours, up to 8-12 hours. Top up subsequent layers can be added every 2 hours. This will enhance the effect of the peel. After the peel has been washed off, a soothing moisturizer cream is applied. What is the Yellow Peel post peel care? The skin peeling occurs typically 2 days after and can continue to 5 up to 7 days. Moisturizer is recommended. Sun screen is essential and must be applied religiously 15 minutes before leaving home and if outdoors, it must be re-applied every 2 hours. With The Yellow Peel you can confidently expect significant skin improvement: less pigmentaton, brighter, clearer and more toned skin. The wrinkle smoothing effect of the peel further enhances the aspect of your skin. 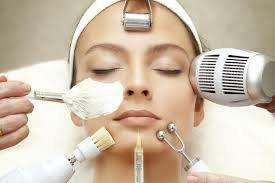 Treatments aimed at the maintenance of skin quality are a vital part of an anti ageing program. The Yellow Peel is a new and exciting skin treatment. Although it is a complex peel, the procedure is simple and affordable.